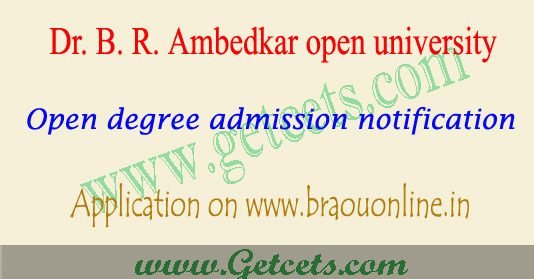 BRAOU Open degree admissions 2019-2020, apply online dr br ambedkar university : Dr br Ambedkar open university degree admission notification is released for Admission into B.A./B.Com/B.Sc Under Graduate Programmes for the academic year 2019-20. BRAOU open degree notification 2019 pdf available on official hosting website www.braouonline.in. AP/TS Dr br Ambedkar Open degree Online registration has already started from 24th January 2019.. Check the Ambedkar open degree eligibility Test exam dates, BRAOU eligibility criteria from the official website. Dr br Ambedkar Open degree online application form is available now on hosting web portal, active link is given of BRAOU application form 2019 at bottom this page. We may agin continue with BRAOU Open degree eligibility test hall tickets 2019 and BRAOU Eligibility test results 2018. Candidates who have completed 18 years of age by 1st July 2019 are eligible to apply, Candidates who do not have completed 18 years as on 1st July 2019 are not eligible to BRAOU Open degree admission 2019. 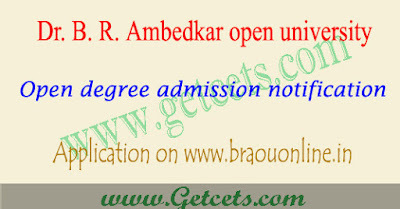 Dr br Ambedkar Open degree Applications 2019 are available in online in BRAOU official website. So candidates who are interested can register from 10th February 2019 through online application process. BRAOU Eligibility Test 2019 will be held on 28th April between 10.00 A.M. to 12.30. P.M. The last date for registration of open degree eligibility test is Feb 28, 2019. Fee details : candidate has to Pay Rs.300/- (Rupees Three Hundred Only) by debit/Credit Card through University online portal OR Rs.310/- (Rupees Three Hundred Ten Only) at the AP/TS online Franchisee Centre towards Registration Fee and obtain receipt. Step 3 : Approach the nearby Study Centre with date of birth certificate/school leaving certificate , along with a latest passport size photo for conformation. Step 4 : Provide the required information through University website and fill your ET-2019 Registration form through online and upload photo and signature. Step 5 :After receiving the SMS from concerned study center, than only the candidate has to Pay Rs.300/- (Rupees Three Hundred Only) by debit/Credit Card through University online portal OR Rs.310/- (Rupees Three Hundred Ten Only) at the AP/TS online Franchisee Centre towards Registration Fee and obtain receipt. Dr br Ambedkar Open University Exam Date : BRAOU Eligibility Test 2019 will be held on 28th April between 10.00 A.M. to 12.30. P.M. Test will be conducted in English, Telugu & Urdu Media at the Study Centers of Dr. B.R. Ambedkar Open University. Applicants should download BRAOU ET Hall Tickets 2019 at least Two days before the Examination Date from the Website (www.braouonline.in). Hall Ticket can also be collected in person one day before the Examination from examination Center chosen by them. Commencement of BRAOU Registration 24th January 2019. Last Date for Dr br Ambedkar Open degree Registration 28th March, 2019.